1. 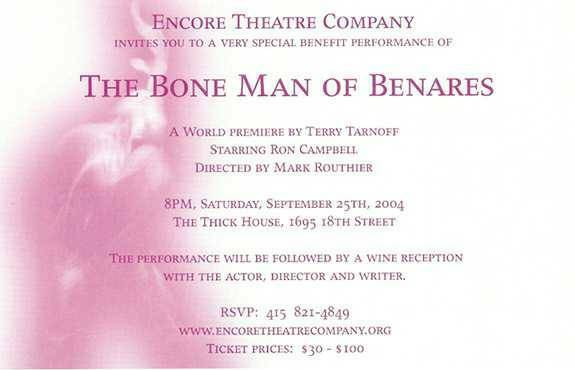 How did the idea of turning The Bone Man of Benares into a play come about? I did a short reading at a party to celebrate the sale of the manuscript, and several people suggested that I expand the reading into a one-man show. I had never even imagined such a possibility, but the idea sounded intriguing, especially when Mark Routhier offered to direct the show. Jandy Nelson, my literary agent, and Seth Jaret, my film manager, saw the potential for an interesting project, and they were the first to encourage the idea. Over the next several months, I adapted the manuscript to a stage version that drew off of what had been the initial inspiration for the book. 2. I had the pleasure of hearing you read excerpts at the release party – there’s definitely a natural sound to an author reading their own work, especially when it’s autobiographical. What’s your view on seeing it performed by someone playing you? I’d imagine that’s a bit surreal. Well, yes, it is. It’s strange enough for a writer to hear his words come alive, but when the character is autobiographical, it adds a whole new dimension. When Ron Campbell did a staged reading of that first draft adaptation, it took me about two seconds to realize the benefits of a real actor doing the part, and a superb actor at that. Ron’s performance injected a vibrancy into the piece beyond anything I’d imagined, and I immediately relinquished any idea of doing the role myself. It’s a decision I’ve never regretted, as Ron has added immeasurably to the development of the play. Watching Ron is sometimes like looking into a mirror and occasionally I catch him watching me and then it’s like a mirror inside a mirror and I start to get a bit dizzy. Ultimately, though, the autobiographical elements aren’t that important, as I always saw the main character as being a universal figure that anyone could identify with. As the performance grows, I suspect that Ron will find his own version of that character, and if that winds up deviating from the author, that’s perfectly fine with me. 3. The Bone Man of Benares is your first novel, and a wonderful one at that – what were the challenges in adapting it to the stage? Adaptations are always tricky and going from book to stage especially so. This particular book is quite expansive, as it takes place over three years and four continents, and I knew I needed to cut back significantly on the locations. More importantly, the book has many themes and I had to choose which of them would guide the direction of the play. When whole chunks of the story get cut, and when many characters disappear, you find the arc and motivations of the narrator changing. It’s kind of like weaving a new tapestry, where you’re using the same thread, just a lot less of it. That thread of the story still needs to connect and draw everything together. And that’s probably the biggest challenge. Beyond the content of the story, there are many technical issues in adapting to the stage. Having written a number of screenplays, I have a certain intuitive approach to how scenes develop, but I had to throw much of that away for the theatrical version. For example, in film I usually go for quick-moving scenes, but on stage, it feels like the scenes need to breathe a bit more, that the audience requires more time with the characters to establish a kind of rapport. There were a hundred other things that I had to “unlearn” as a screenwriter, things like how to make transitions between scenes — which is quite different in film — but I also did use certain screenwriting techniques just to shake things up a bit. I tried to turn to my advantage the fact that I’m not totally conversant with the language of theater. It’s easier to break the rules when you don’t quite know what they are. I’ve also been incredibly fortunate to be involved with a wonderful creative team that has had a great deal to do with the development of the play. In addition to Mark and Ron, who both have great instincts and a wealth of experience to draw upon, Jandy, acting as our creative consultant, has been instrumental in establishing the tone, continuity, and direction of the play. Lisa Steindler and James Faerron, the producers, have been a constant source of support and have made the whole process much more enjoyable than I’d ever expected. I couldn’t have asked for a better group of collaborators. 4. Many authors use their own experiences, but tend to “hide” as it were, behind their characters. As an aspiring playwright myself, I can say there’s definitely a certain security in that. Was there ever the thought of taking a bit of “creative license” with your own story? No, this is what happened all right, and pretty much exactly the way it happened. Given that the story took place thirty years ago might lead people to think that whole pieces have been “re-remembered” but, in fact, I’m clearer about most of those events than I am about what I had for dinner last night. Of course, in post-modern deconstruction theory, one might question the whole issue of objective truth, and as a former LSD enthusiast, I would include myself in that camp. It seems to me that ultimately it’s ideas we’re trying to convey as writers, and it probably doesn’t much matter whether the events that inspire them are fact, fiction, or somewhere in-between. 5. Future plans for The Bone Man of Benares? I understand it’s being optioned? Yes, film rights were optioned even before the book was published, and we are hopeful of making the movie. The book is presently making the rounds of studios and production companies in Hollywood, and it’s also in the hands of several actors and directors. The next step is to get commissioned to write the screenplay, something I very much look forward to doing. Whether it becomes a big studio production or more of an indie shoot-on-the-run affair is anyone’s guess. There are advantages to both. But either way, I think the filming would take us back to a number of locations in the book, something I would greatly look forward to. Some guy still owes me five bucks in Kenya, and if I can track him down, I figure the interest alone will pay for catering. Meanwhile, the play is the play and it will hopefully succeed on its own terms, independent of the book and movie. It tells its own story, with its own rhythms and trajectory. I’ve learned that the story needs to adapt to the form rather than the other way around, so it becomes a different entity in each incarnation. I like that idea, actually, as it forces me to rethink the themes within each new version. It’s an opportunity to relive the experience again, emphasizing different aspects of the story, different characters, and maybe even coming to different conclusions.